This entry was posted on Wednesday, May 25th, 2011 at 10:45 am and is filed under Philosophy. 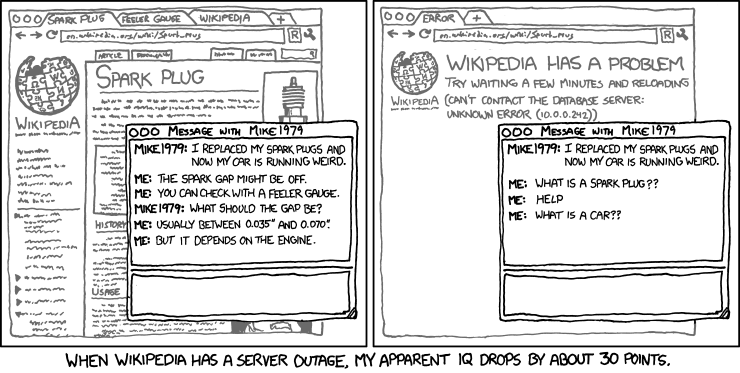 Tagged: Jimmy Wales, Philosophy, Wikipedia, Xkcd. You can feed this entry. You can leave a response, or trackback from your own site. And philosophy has no answers. “Turkish Army” and “Turkish Armed Forces” point to each other. Philosophy has nothing to say about the Turkish Army. Therefore, it does not exist. So, twenty steps from Øivind Andersen and I was there. That was actually quite interesting. It’s an artifact of the definition of philosophy, and the history. Philosophy is the “Love of Wisdom”, in Greek. Essentially every subject of knowledge today was once considered a branch of philosophy, which is why people get Ph.D.’s (Doctorates in Philosophy) in such varied subjects as mathematics and literature. It’s a word with a broader meaning than one might imagine — a very broad meaning. In fact, every useful subject within it has been “broken out” into its own field as soon as it started developing a significant body of knowledge. A particularly important example is “natural philosophy” (which became “science” and has been further splintering). Logic was a late bastion of philosophy departments, but math departments have it now. Philosophy departments have only the leftovers — which does include many of the roots of knowledge, but also a lot of boring dead ends that never developed *enough* to get their own departments. So by this test, philosophy’s claim to be ‘the root of knowledge’ is no better than those of biology and mathematics, alas. I started out at “List of Star Wars species (F-J)”. It took me there, too. The first link often locates the more general context of the specific hierarchy. So basically as you click on the first link, you’re working your way back up the taxonomy. And as the ontology becomes more general, you’re going back to the logical foundations of knowledge. Science, for example, ~is~ a subset of philosophy, because science is a knowledge-oriented project distinctive for its perspective on epistemology. And if you head towards more general discussions of empiricism vs. rationalism, you’re in philosophical grounds. It’s not that “philosophy is all the useless bits”, it’s that the pragmatic applications of certain epistemological and metaphysical assumptions are arguments in their favor. In contrast to ethics, for example, where various meta-ethical issues are more unsettled. Philosophy doesn’t point to rational argument. It goes to existence, and then senses, and then a few others (including biology) before getting back to philosophy. All of the members of that loop are bases of the tree. I think the philosophy article has been edited since I wrote this post. It took 23 clicks to reach philosophy from my last wikipedia search (“Sean Burroughs”, a baseball player). Like some previous commenters, my road to “Philosophy” first rambled through “Science”. « Are You Not Entertained? !